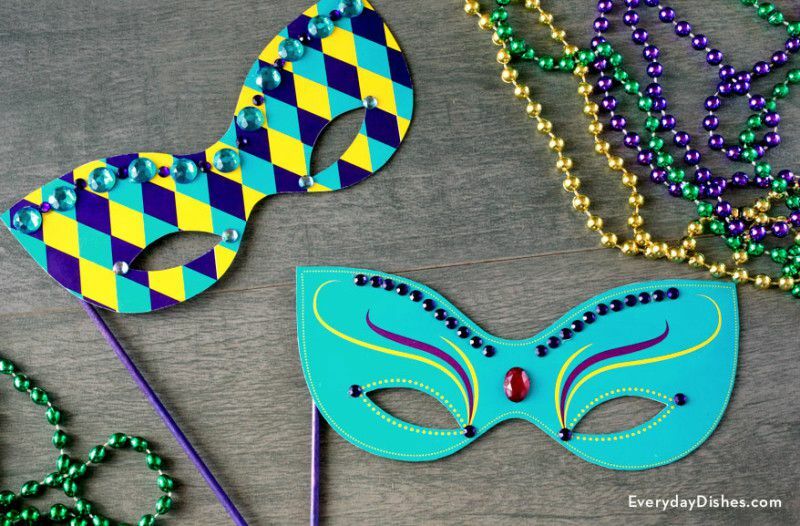 These free Mardi Gras masks are a great alternative if you don't have the time to use a free Mardi Gras mask template to decorate your own mask this year. All of the printable Mardi Gras masks below are already colored and you just need to print them in color from your home printer. Cut and then attach to your head with a string and you are ready to party. These printable Mardi Gras masks don't just have to be for Mardi Gras either - they're great as masquerade masks! You can also find more Mardi Gras freebies like free Mardi Gras clip art and printable Mardi Gras coloring pages. 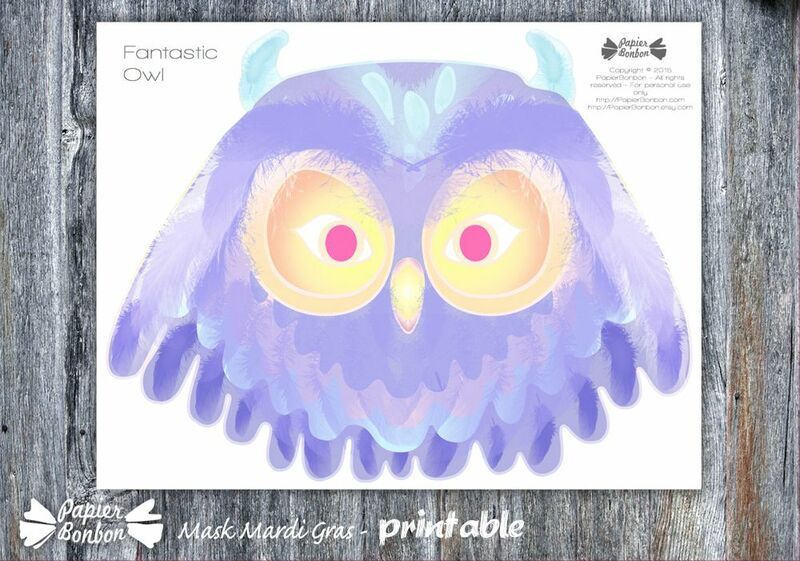 No one's going to believe that you printed out this beautiful owl Mardi Gras mask on your computer, and they especially won't believe you did it for free. Open this mask as a PDF file and then print it out in color. Despite the soft feathers of the mask, there are defined lines which makes it a quick project to cut out and use right away. There are two printable Mardi Gras masks here. One is a traditional blue, purple, and yellow pattern while the other one is teal with colorful accents. They both print out on one page. Use your own craft supplies like rhinestones and paint to decorate these masks further or just leave them as is for a quick mask. This printable Mardi Gras mask is relatively simple but has some beautiful detail on the top that really makes it stand out. This printable Mardi Gras mask just needs to be printed, cut, and have a ribbon or elastic attached. If you want to, you could easily adore this with ribbon or glitter to make it extra special. This download will get you four free masks, each opening as their own PNG file. There are two different designs of patterned masks in purple and green as well as two masks in black and white that you can color in before or after printing. I adore this plaid style printable Mardi Gras mask from Fantasy Jr. and I think you will do. This is a great Mardi Gras mask because it's going to look great on anybody, regardless of age or gender. Plaid Mardi Gras Mask by Fantasy Jr. Here's another great printable Mardi Gras mask, this one has feathers coming out from the mask. Print this mask out and embellish with more feathers to make it even more spectacular. This is a very detailed and beautiful printable Mardi Gras mask that would look great on someone looking to show their flair this Mardi Gras. It's in the traditional green and purple colors of Mardi Gras. One sheet of paper will get you two colorful masks printed out with one go here. The top mask is a variation of plaid with muted orange, yellow, blue, purple, and green. The second mask is a floral pattern of yellow, green, purple, and blue in brighter colors. There are cut lines included on this print-out, which will make it quick to cut out your free Mardi Gras mask for this year.